Disappointing quarterly results and death knells might stop an ordinary company in its tracks, but Palm continues to forge ahead. Despite stock prices hovering at the $4 mark, the company announced on Monday that it would join forces with AT&T to bring its Palm Pre Plus and Palm Pixi Plus phones to the carrier. The announcement gives Palm a presence on three of the U.S.’s four major carriers, echoing similar moves last week from Google. Palm has been floundering recently and takeover speculation has begun to circulate; adding a third carrier to its portfolio may be a last ditch effort for the company to stay afloat. The Pre Plus and Pixi Plus will be available for $150 and $50 respectively, though that price is after a $100 mail-in rebate and requires that customers sign a new two-year contract with AT&T. While service pricing was not given, the phones will require a data plan; the fine print, however, says that an unlimited data plan is merely “strongly recommended.” In addition, the unlimited data plan confers free access to AT&T’s nationwide network of Wi-Fi hotspots. A time frame for availability was not mentioned, with the two companies saying only that the phones would be coming soon. 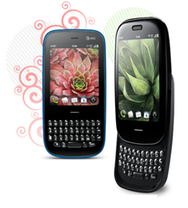 Palm debuted its Pre smartphone and brand new webOS at the 2009 Consumer Electronics Show. At the time exclusive to Sprint, the Pre shipped in June of last year, but widespread rumors suggested that the phone would make its way to Verizon in 2010. Sure enough, the Palm Pre Plus and Palm Pixi Plus were announced for the carrier at this year’s CES. However, lackluster sales of the its devices has left Palm in dire straits, which CEO Jon Rubinstein has attempted to combat by issuing inspiring missives to the company's employees. While adding AT&T as a third carrier option may open some doors for Palm, the company faces the same uphill climb as Google’s Nexus One if it’s merely relying on network availability to drive sales. Meanwhile, the iPhone continues to rack up revenue with the exact opposite approach—because let’s face it, nobody ever bought an iPhone on the basis of its carrier partner.